Oh my gosh this bread! I was so happy about it. I made it on a day when I was feeling unsure about what I wanted to do but knew I wanted to bake something. After thumbing threw a ton of books and old magazines I found this simple recipe. A no-knead dough that was like a beautiful english muffin?! A bread with corn meal and nooks'n'crannies! I was SO happy I tried it.. so easy and awesome. A fried egg sandwich would be so perfect with this. 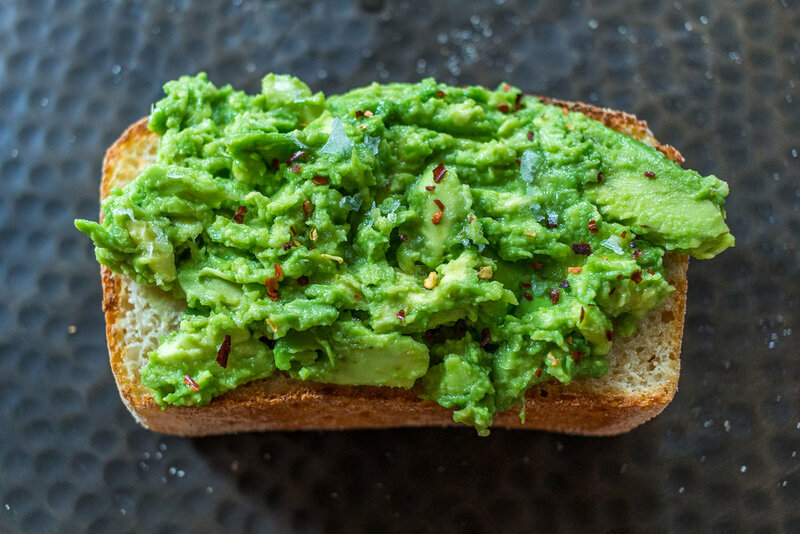 You can toast it and mash avocado on it, smear some ricotta, drizzle honey, spread peanut butter or just have with a butter. Any which way you should make this because you don't know what you are missing! In a large mixing bowl whisk together 3 cups of flour, the yeast and baking soda- set aside. In a medium sauce pot combine milk, water, salt and sugar together. Heat over medium-low heat till it is 120-130 degrees. Stirring occasionally. Once milk is heated pour into flour mixture stir together with a wooden spoon. Stir in remaining 3 cups of flour. 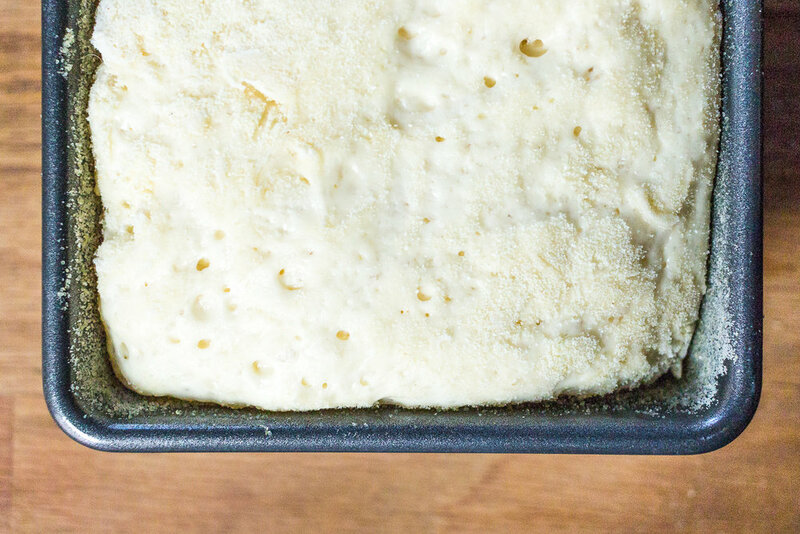 Divide the dough into the two prepared loaf pans, cover both with a clean kitchen towel and place in a warm spot for 45 minutes or it is doubled in size. (Preheating the oven makes the stove top a perfect spot for this) After the 45 minutes bake for 25 minutes, or until golden brown. 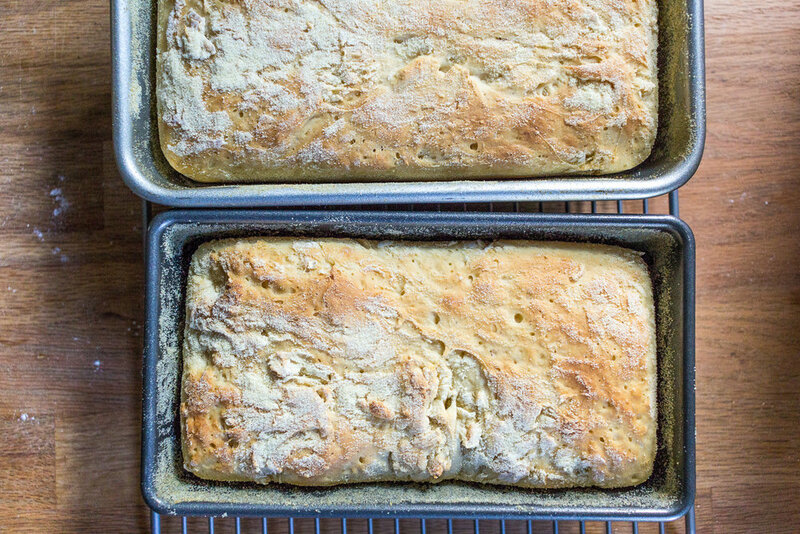 Immediately remove bread from pans and allow to cool on a wire rack. Slice and toast! I double wrapped mine with plastic wrap and stored on the counter and it lasted about 1 week. As silly as it sounds eating pretty foods set you up for a better day. This beautiful breakfast is a perfect example. I'd been thinking about roasted strawberries for few weeks now. I don't really know why but I had never had them and the idea just sounded fancy to me! Roasting the berries gives them a sweeter and deeper flavor. Also Conor and I have been on an oatmeal kick so it seemed like a perfect marriage! Speaking of marriage...we're getting hitched in THREE months! :) Holy Cow! When we went to Mexico in January we had the most delicious over-night oat situation that was made with coconut milk chopped up fruits, mint and honey and it was AMAZING. SoI think I was trying to channel that into this but as a hot breakfast. It's not the same at all, but it is still really really good and you should try it! serves 1! but this can be doubled easily. In a medium size sauce pot bring the coconut milk to a low boil over medium-high heat. Add in the cup of oats, it will really start to boil at this point and you can turn it down to more of a medium low. Add pinch of salt and stir occasionally. Once the berries have roasted for 10 minutes add coconut to the sheet pan, I kept mine separate so the coconut wouldn't get too stained by the berries. Let roast another 5 or so minutes, but keep an eye on the coconut! Take out and let slightly cool. Place the roasted berries on top along with the coconut and the sprinkle pistachios. Drizzle with honey for a little extra sweet if you'd like. Enjoy! Mousse is one of my favorite desserts, and it has also become one of Conor's favorites too. It's hard to find something wrong with smooth chocolate melted and folded into whipped cream and egg whites. It's so light and fluffy and dreamy. Maaaaybe I started writing this in bed while enjoying some of this mousse. 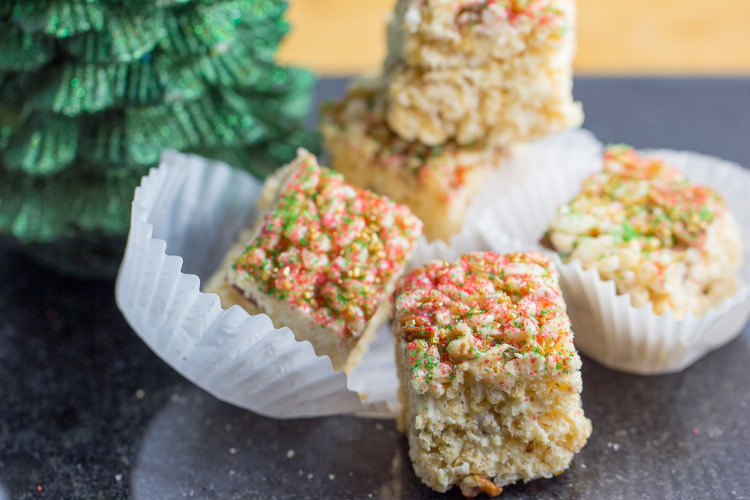 It just feels so fancy but it is approachable and something you can totally make at home. Putting it into the teacups is a cute added touch but it is just as good in a ramekin or whatever glass you have hanging around! With Valentine's Day approaching I think this is an impressive thing to make for someone or to make together! In a medium bowl, beat the chilled heavy cream till you have firm peaks. For me, this took about 9 1/2 minutes. Stick the bowl in the fridge so it stays chilled. Next, in a medium glass or metal bowl combine the yolks, coffee, salt and 2 tablespoons of sugar. Set over a pot of simmering water, but be sure the water isn't touching the bowl. This is called a double boiler, fancy pants. Cook this mixture, whisking constantly until it is lighter in color almost doubled in volume. If you have it, stick an instant thermometer in and it should eat 160 degrees. Remove from heat and whisk in chocolate chunks. Leave out and let it come to room temp, stirring occasionally. In a another medium bowl using an electric mixer, beat the egg whites on medium till they are foamy, gradually add 1 tablespoon sugar. Turn the mixer up and beat the eggs till you have firm peaks. 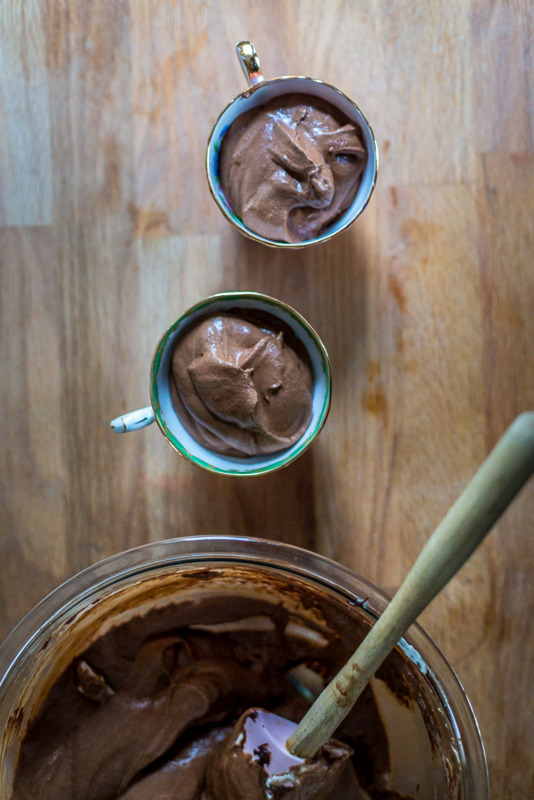 Fold egg whites into chocolate mixture in two additions. Next fold in whipped cream just till it is incorporated. Divide into teacups or ramekins and let chill for at least 2 hours in the fridge, Can be made up to 1 day ahead.